Hard Rock Cafe is one of the most famous cafe and restaurant chains in the world. It exists in over 70 countries. The first cafe opened two Americans in the 70s in London. Soon branches were opened in the USA, later on all continents. In Italy there are three Hard Rock Cafes in the three largest tourist resorts Rome, Venice and Florence. This is Florence is centrally located in the city, about 200 meters from the cathedral. There is American food like huge hamburgers, but also other international dishes. Coffee, beer and other drinks are served, as well as mostly pretty good rock music. In the late evening, the Hard Rock Cafe Florence is often a party atmosphere with lots of alcohol etc. The Hard Rock Cafe Florence is often full, there are queues at the entrance. Sometimes you have to wait for hours to get a table. But you can reserve a table. But you have to order a menu right away. We recommend, although the portions are large, to take the large menu (Diamond Menu), since it only costs about 3 euros more. As in every Hard Rock Cafe there is also a shop in the branch in Florence. The shop mainly sells clothes. The T-shirts and sweaters of the chain Hard Rock Cafe have been a fashion racer for decades. Surely each of you has seen the legendary shirts with the inscription Hard Rock Cafe + city name. These can be bought in the shop of the cafe, in Florence of course the T-shirts with „Hard Rock Cafe Florence“. Florence is the English name of the city of Florence. They are available in several colours and cost a good 25 euros in the Hard Rock Cafe shop at the beginning of 2019. Like I said, there are cafes in more than 70 countries. In Germany there are four Hard Rock Cafes in Munich, Hamburg, Cologne and Berlin (see: Hard Rock Cafe Berlin). In Austria there are two (Vienna and Innsbruck). In the Netherlands there is a Hard Rock Cafe in Amsterdam (see Hard Rock Cafe Amsterdam), in Switzerland there is as far as we know no Hard Rock Cafe yet. In the Czech Republic there is one in the centre of Prague (see: Hard Rock Cafe Prague). In Italy there is also a Hard Rock Cafe Rome and a Hard Rock Cafe Venice. All cafes of the chain in the world are quite similar, also from the menu and the prices. The prices are not exactly a bargain, but the portions are very large. Besides it is simply a unique experience to have visited a Hard Rock Cafe once. There is usually good rock music, sometimes bands play live. As I said, make sure to book in advance. On site in Florence you have at most in winter a good chance to get a table like this. Often very long queues. The cafe is right in the center. Parking is very difficult in the area. Moreover, as a tourist you are not allowed to drive into the city centre of Florence (more about this here). But the city centre is small and everything is within walking distance. 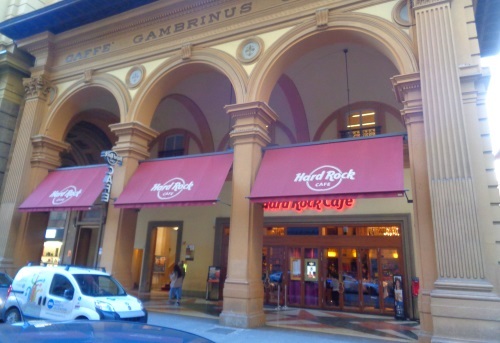 The Hard Rock Cafe Florence is directly behind the central square „Piazza della Repubblica“. The cathedral is 200 meters north-east, the main station Santa Maria Novella about 500 meters north-west.